At 121 Air Sea Cargo PLC, we have invested heavily on our resources and staff training to meet demands of IT and telecommunication industry. We deal with importers and exporters from Cable to computer parts, mobile phone accessories to handling of projects. We have staff who are experienced in dealing with IT and telecommunication industry, can talk your language take care of your consignments of any size for export and import with highest level of service and on most competitive rates. 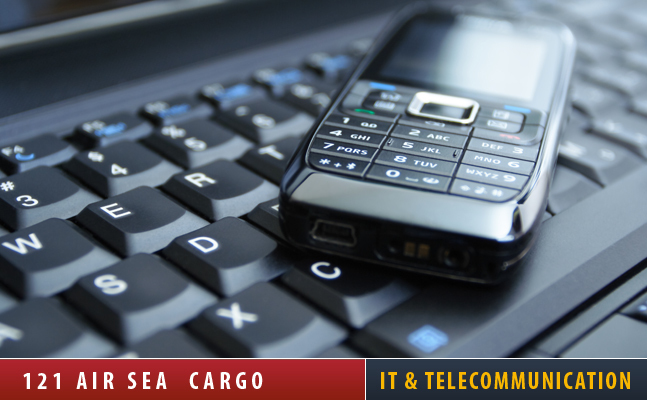 “121 Air Sea Cargo PLC IT WORLD Team” can act as your in house logistic department. They can provide an individualized service by giving you advice on the most cost effective method of shipping which suits your delivery requirements and cost needs and keep you updated about the status of your order at all times. We can report to you as you like by using your purchase order numbers or article numbers as reference for all communication. We act like a bridge among your supplier, you and your buyer. You can always rely on 121 Air Sea Cargo PLC for timely deliveries to your warehouse or directly to your buyer at most competitive rates. We provide specialised services for air, sea and road freight for all import and export shipments. We also provide services for secure warehousing, labelling and relabeling, pricing and tagging, packing and repacking for your products. We specialised in handling shipments of Mobile phone accessories, Mobile phones, Computers, Computer parts, Computer accessories, Machinery, Cables, Printers, fax Machines. Photocopiers, Imaging Machines and Imaging Printing Material.